Formerly a Manhattan entertainment attorney and a contributing editor to the quarterly art magazine SunStorm Fine Art, Susan Lynn Solomon now lives in Niagara Falls, New York, the setting of many of her stories. In January 2018, she was appointed as the facilitator of the Just Buffalo Literary Center/Buffalo Central Library Writer’s Critique Group. Since 2007 her short stories have appeared in numerous literary journals. These include, Abigail Bender (awarded an Honorable Mention in a Writers Journal short romance competition), Ginger Man, Elvira, The Memory Tree, Going Home, Yesterday’s Wings, Smoker’s Lament, Kaddish, and Sabbath (nominated by the editor of Prick of the Spindle for 2013 Best of the Net, and winner of second place in the 2017 Word Weaver Writing Competition). A collection of her short stories, Voices In My Head, has been released by Solstice Publishing. Susan Solomon is the author of the Emlyn Goode Mysteries. A finalist in M&M’s Chanticleer’s Mystery & Mayhem Novel Contest, and a finalist for the 2016 Book Excellence Award, her first Emlyn Goode Mystery novel, The Magic of Murder, has received rave reviews, as have the novelettes, Bella Vita, and The Day the Music Died, and the novel, Dead Again, which was a finalist for the 2017 McGrath House Indie Book of the Year. In the latest Emlyn Goode Mystery novelette, ’Twas the Season, and the new novel Writing is murder, Ms. Solomon once more demonstrates that murder has a sense of humor. 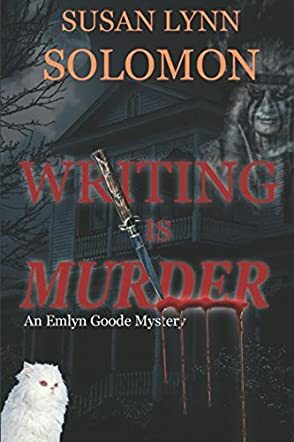 Writing is Murder: An Emlyn Goode Mystery by Susan Lynn Solomon is about a writer, Emlyn Goode, who has a witch in her family history. Emlyn has joined a writer’s group, and is dating a cop, and has a best friend who makes potions. Oh, then there is her cat, a very perceptive albino with pink eyes. There is talk about a Native American curse, and she wonders if it has to do with her friend’s murder. Her boyfriend is on the case, though it turns out that she is one of the suspects. Emlyn ends up meddling in the case to prove her innocence, much to her boyfriend’s dismay. As she does so, she finds out that she doesn’t know her friends as well as she thought. As a writer, I just loved Writing is Murder by Susan Lynn Solomon. I thought it was quite clever. This would be the perfect treat for Halloween. A Native American curse, a couple of witches, ghost huntings, a few hot men in uniform (eye candy), and a sprinkle of time travel. The perfect remedy with no calories. I loved the fact that Susan Lynn Solomon used characters my age or even older. So many cozy mysteries have younger characters. I was finally able to relate, and that was quite refreshing. The best part was the fact that the plot had more than one twist. I am usually good at guessing who did it, but I was only partly right, and that really impressed me. Susan Lynn Solomon even made me laugh a couple times. I am looking forward to reading more of her work.